This is what I believe a true Pinot should taste like, but it’s only my opinion. It is deliciously fragrant with plummy and berry, vanilla flavor s, just enough tannins for balance and that astringent minerality to hold it all together. The grapes are sourced from Russian River Valley, Lodi, Monterey and Clarksburg. Aged 10 months in French and American Oak. A smooth a eminently drinkable wine on its’ own and wonderful paired with a chicken sausage, fennel, red onion, olive ragout. Great deal at $9.99. I couldn’t agree more! 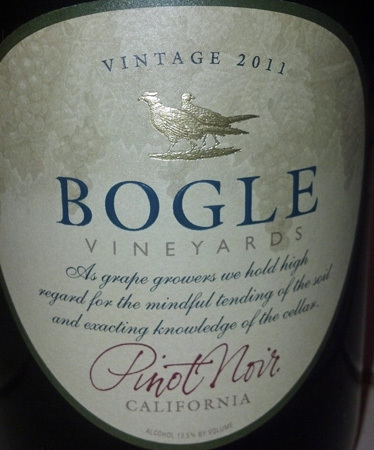 In fact, I haven’t found a bottle of Bogle that isn’t exceedingly true to the ideal of it’s grape. And TJ’s is always the best price in town on their brand.